This repository contains software developed and used by JSK at The University of Tokyo. 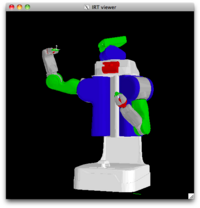 ;; sample program to show how to make pr2 posture from euslisp, THIS WILL MOVE REAL ROBOT, CAUTION!!! Open an issue on our issue tracker if something doesn't work as expected, or if you want new features implemented. Use the pull requests system to send us solutions for the issues so we can implement them in this repository. '''NOTE:''' EusLisp needs X11 Library, but Mac OSX mountain lion no longer supports it. Given this case, you'll need to install XQuartz. Also for Mac OSX lion (or older) users it's better to install the latest XQuartz for safety and compatibility reasons. Packages listed below should be intalled using setup.exe. Software in this repository is based on the EusLisp language.